Exactly 21 minutes after publishing that post, the Douglas County Sheriff’s office was alerted to an active shooter on the campus of Umpqua Community College. That means at the exact moment I was writing about Christians being metaphorically lynched by the Institutional Left — the Oregon shooter was scurrying around campus preparing to shoot people in the head for their Christian faith. The shooter didn’t build that. Guns made that happen. The President proudly politicized the tragic events, thereby re-affirming the left’s commitment to not letting “good crises” go to waste. If I had to come up with a definitive answer for President Obama, I’d guess he’s agnostic or atheist but with an affection for Islam coupled with a disdain for Christianity. Why? Because when he talks about Islam he speaks personally and glowingly, and when he talks about Christianity he speaks academically and critically. What’s more, I believe Obama’s ultimate religion is redistribution — and that he sees Christianity as a wealthy religion that therefore loses immediate ground to the religion of Islam which he sees as a poor one. We saw this exact same deflection — this exact same audacity, this exact same refusal to engage in any introspection at all because they were too busy “not letting good a crisis go to waste” — after the August 26, 2015 murders of WDBJ reporter Alison Parker and cameraman Adam Ward. In that case, the leftist gunman believed “RACISM!” to be the cause of all of life’s woes, and thus thought he was justified to go shoot a couple of white folks. Did Obama and the left stop even briefly to consider that they may have played a part in fanning these flames of misguided racial animus? And so today I turn on MSNBC and see Colin Goddard — who I’d never heard of before but apparently is a ‘prominent’ anti-gun nut — bloviate about how guns are the problem. 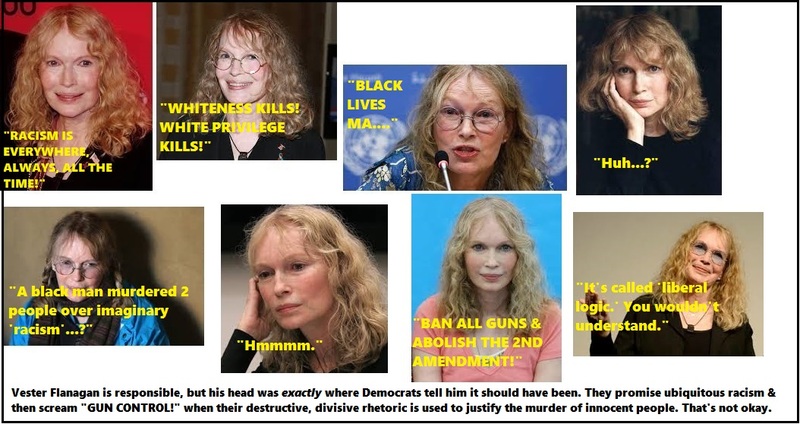 So the left will fan the flames of racial animosity, and when one of their faithful uses that as an excuse to go on a killing spree — guns, not leftism, are to blame. The left will deem Christian-based organizations as “Hate groups!” who are a threat to all of mankind, and when one of their faithful uses that to excuse his attempted killing spree — guns, not leftism, are to blame. And of course as demonstrated yesterday by the events in Davis County, Oregon…the left will trash Christians and Christianity any chance they get, and when someone uses that as an excuse to go on a killing spree — guns, not leftism, are to blame. Over and over and over again…leftism is to blame. And the solution, as noted throughout most of this now nearly month-old blog, is for we on the right to start adopting new messaging that will actually have us winning the national conversation for a change — thereby mitigating leftism’s influence. As it stands now, the only time we win the national conversation is with respect to the 2nd amendment. And that’s nothing to sneeze at! But as long as the institutional left continues manipulating public opinion using lies and hate as their primary weapons, and the ends-justify-the-means Democrats continue audaciously deflecting blame away from themselves and at actual victims of this persistently leftist violence — we can expect more of the same. If your child spent time every week with a psychologist who filled his head with lies about the hardships he endures in life, ultimately warping his world view in ways that are exponentially more destructive than constructive — would you keep sending him back to that psychologist? Such is the case we allow among our mostly recreationally-engaged electorate at the hands of the Democrats and institutional left. Our elected officials in the GOP, their inbred strategists & advisers, and the dominant majority of our right-leaning media and non-profit groups — fail miserably when it comes to reaching that recreationally-engaged electorate. We can do so in ways that sustain a united right, attract/educate those recreationally-engaged voters, and most importantly with respect to this post — disarm the institutional left and put the Democrats so far on defense that they’re forced to repackage their entire platform. But we won’t, because those we rely on to craft and communicate more compelling messaging are often too busy elevating themselves and each other to be bothered with doing anything other than preaching to already-faithful choirs who will ensure clicks for their cliques. More often than anyone else, anywhere else…the left are responsible for the violence we see play out over-and-over again across our nation. And at the root of that violence, the left are responsible for the deficit of liberty eclipsing all other US deficits as it exacerbates division, disparity and destruction. We on the right are responsible for stopping the left, and God willing our amplified voices will start doing so in ways that eclipse preaching to our already-faithful choirs. You’re right. I actually hadn’t connected their rhetoric with these shootings before. But, it’s just too coincidental. Every shooting seems to play into their hands. But, of course, they have been drilling the nonsense of hate into the brains of these crazies. So, yes, eventually, their narratives come to fruition. Thanks for clarifying.